After Steve’s initial post on the Sharpshooter, which can be found here, I decided to continue focusing on it for my inaugural blog post (You can leave tips in the jar by the door). The short answer is (of course): it depends. On how your armies are currently grouped, on terrain numbers, what your opponent is doing, and a hundred other considerations. However, I think it’s helpful to see likely outcomes against some useful benchmark to get an idea of what the army is capable of, which can help inform our strategic, and sometimes tactical, decision-making. The benchmark army I have chosen is 12-health worth of that most ubiquitous of villains, the Zombie. Why 12-health of zombies? Why not Unseelie Fairies, or Dragonlords, or <insert die here>? Because A) Zombies are commons, which when in force are some of the most consistent result-generators around, B) They’re specialists in melee and saves; they’re quite dangerous in melee, having a 67% (or favorable 2 to 1 odds) of generating melee results, which is useful when we test their attack vs our army’s defenses, and they save very well, having a 50% (1 to 1) chance to generate a save on any roll, which is important to resisting the effect of Bullseyes and our missile results, C) 12-health is a convenient number, allowing us to test 12 common, 6 uncommon, 4 rare, 3 monster, or a wide variety of mixed dice combinations for our army, and D) Everyone likes beating up zombie hordes. I’m looking at two armies today to fight against our zombie horde, representing extreme decisions. The first army is 12-health worth of Bowman dice (12 dice total), the second army is 12-health worth of Sharpshooters (4 dice total). 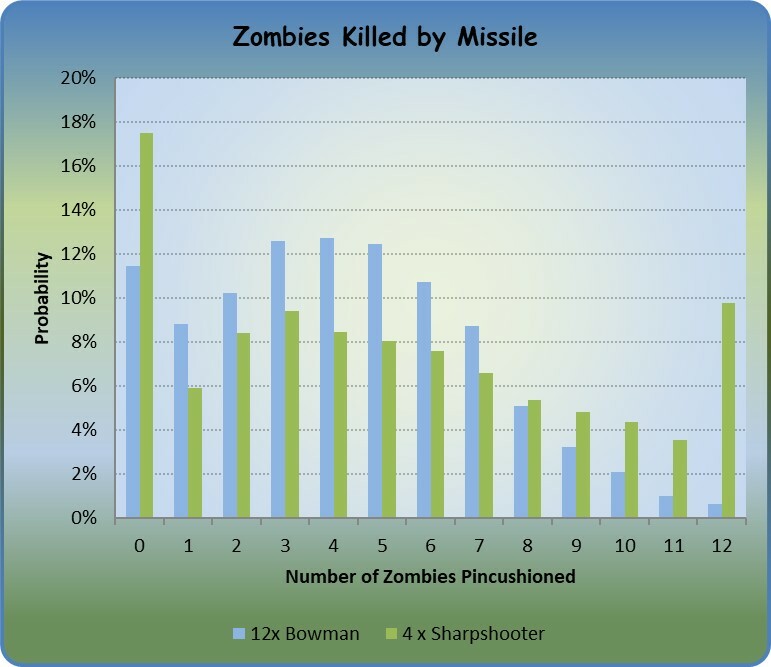 My measurements of choice: How many zombies do we kill? And how many losses do we suffer from them? No dice were harmed in the production of this blog entry. Median is the coin flip point – 50% above, 50% below. Mode is most probable. The commons have about a 50% chance to kill between 2 and 5 zombies; for the rares, it’s 50% for between 2 and 7. 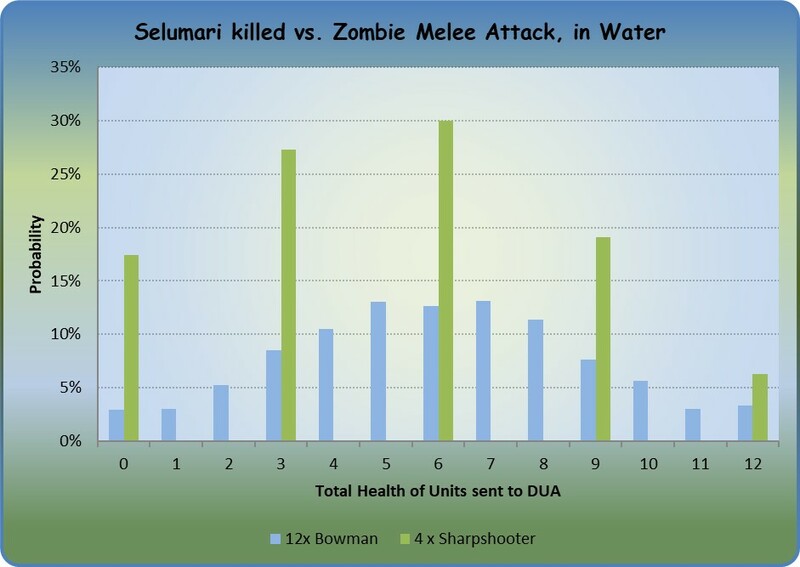 The commons are more likely to do some damage, but overall kill fewer zombies per action, while the rares are more likely to devastate the enemy army. 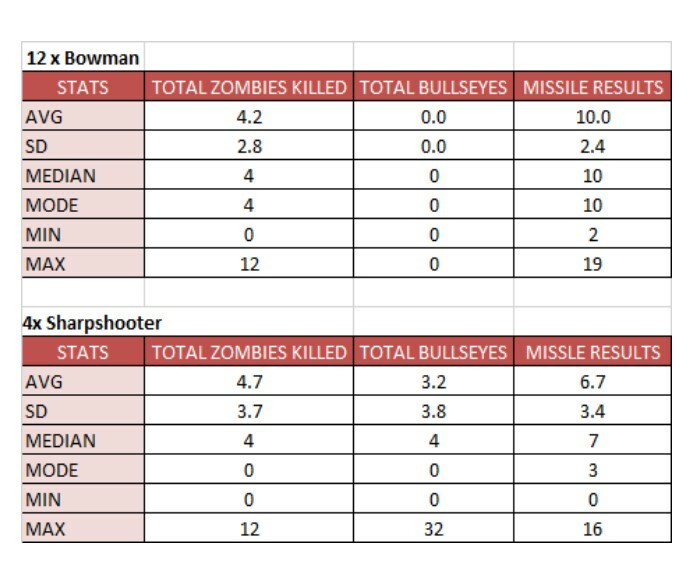 The Sharpshooters have about a 17% chance (1 in 6) to kill 10-12 zombies with a single action, while the Bowmen only have about a 3% chance of doing that. Notice if you count Bullseye as just a “missile result”, you end up with the same average results for both armies. But this is a bit deceptive; Bullseye is really, incredibly powerful. Think of it as a Lightning Strike that you don’t have to pay for, and can strike twice (or more!) – plus it gets around those annoying defensive spells like Open Grave and Ash Storm, while the standard Bowman army does not. The fact that the Sharpshooters can wipe out the zombies in a single action is a testament to its power. The rare dice can certainly shake up a game – so why wouldn’t you use them? Consistency is a big factor – rares boom or bust more often than commons; the Sharpshooter army has a higher standard deviation than the Bowman army. Strategically, rares are high-priority targets for enemy armies; they’ll get Lightning Struck, Slayed, Plagued, Bullseyed, Finger of Death’d 68 times, and otherwise be murdered in unpleasant ways more frequently than commons. They’re also more expensive to bring back with magic. Which brings us to the other part of the coin: If the zombies get to swing first – how much health do we expect to lose? Important note: this chart is assuming the Coral Elves are able to count their maneuvers as saves. Both armies save about the same, which is to say, not very well (archers are fragile things). The median of 6 indicates 50% of the time, the armies will lose 0 to 6 health, but the other 50%, they’ll lose 7 to 12 health. The rares are again booming and busting harder; they have a 1/6 chance of taking no casualties, or taking 9 casualties (3 dice). A well-timed Palsy spell by the undead would compound this even further. Would you rather lose 6 commons or 2 rares to an attack? 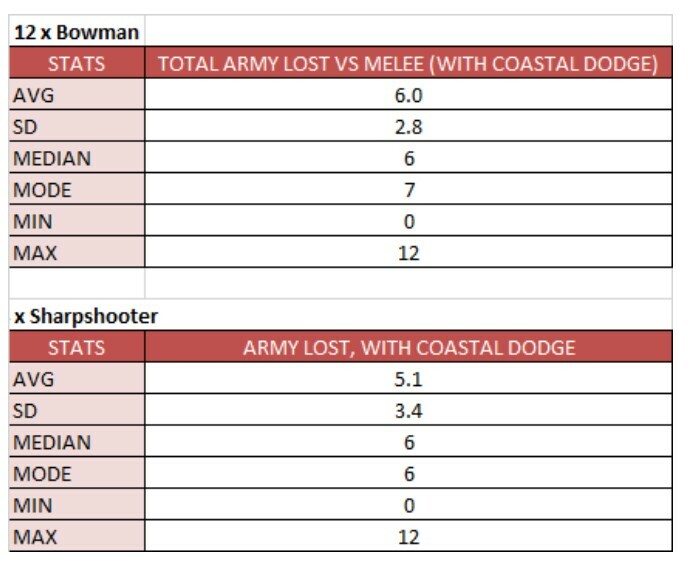 Now that I’ve (hopefully) whetted your appetite a bit, the next entry will look at the all-common Bowman army, vs 9 Bowman and a single Sharpshooter, so that we can directly gauge the impact of a Sharpshooter (and, thus, Bullseye) over vs. another 3 Bowman. Next Post Friday Night Challenge – Part 1 – A Scalders, Swamp Stalkers and Undead try out. Nathan, it might also be an interesting exercise to try the same with 6 x Archers so that we can see the complete ‘single unit type’ picture. Just a thought. I like this article a lot and think that the level of humour vis a vis ‘No dice were harmed in the production of this blog entry’ hits the mark. Nice first post. I look forward to seeing many more now that you know the ropes. Yeah, I was planning on doing all uncommon dice, plus all monster dice, possibly raising the health of both armies (24 and 60 health come to mind). There’s a lot to look at, so I plan to prioritize any specific requests from folks versus my own hair-brained ideas, which currently include dragon attacks, hybrid armies (archers and light melee, for example), and mixed races.